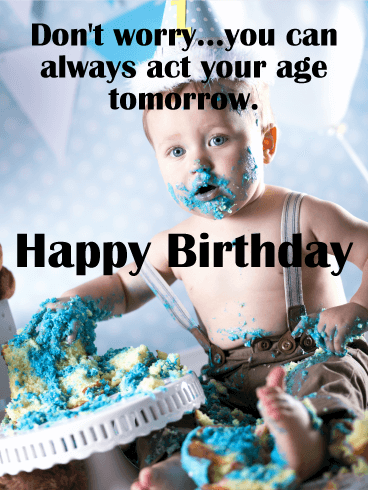 Send wishes to him for a spectacular day today and every day with this birthday card. You will send him wishes for health and happiness with this shining golden card that is sure to brighten his mood when he receives it. Let him know you're thinking about him on his birthday when he opens his inbox. 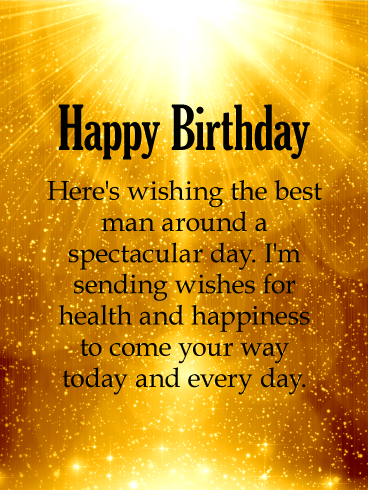 Your birthday wishes for him are displayed on a stunning golden sunshine background. Happy Birthday - Here's wishing the best man around a spectacular day. I'm sending wishes for health and happiness to come your way today and every day. 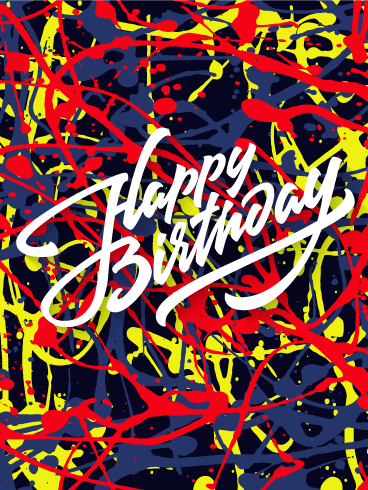 A bright and cheery birthday greeting card for your favorite guy! 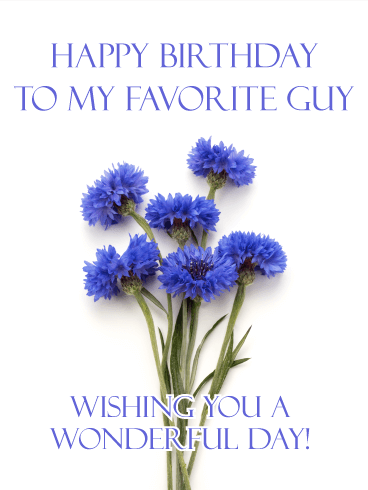 Send him this delightful birthday greeting card and make his day. We all know someone pretty special and it's important to let him know we’re thinking of him on his special day. It's quick, it's fun, it's easy to send warm wishes to all your favorite friends and family with these beautiful birthday cards. 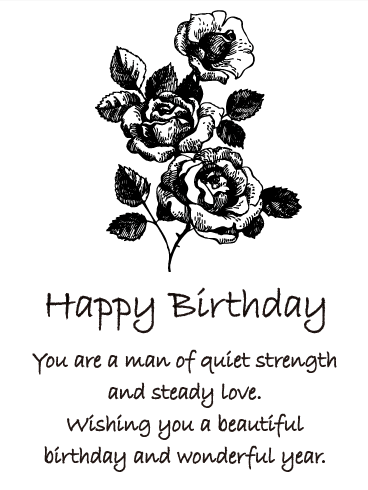 A simple and elegant birthday greeting card for an amazing man. Small gestures can mean the world. This stylish, floral birthday card is the perfect gesture for a quick and warm way to wish a great birthday to someone special. Strong yet graceful, this birthday greeting card is just what you've been looking for to send to the amazing man in your life. A charming and sweet note to an amazing man! 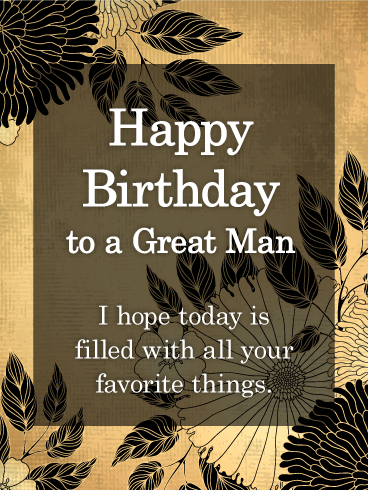 Here's a delightful idea-send a birthday greeting card to your favorite man today! He will appreciate the sunshine and thoughtfulness it brings to his inbox. Let your love know you feel oh-so lucky to have him in your life and send this lovely birthday card today! What would life be without him? Not nearly as fun or as beautiful! So make it a great day and send him these sweet thoughts. Sometimes it's hard to say all the things we want to say. That's why birthdays are so wonderful. It's a chance to remind our loved ones about all the things we cherish in them. This birthday greeting card celebrates a thoughtful and generous man in your life. Take a moment to remind him how proud you are of the man he's become, and send this thoughtful and artistic birthday card today. Quiet strength and steady love. For the man who is philosophical and thoughtful, patient and introspective, this delicate flower will be a welcome gift. Kindest is felt in the smallest yet sincerest of gestures. 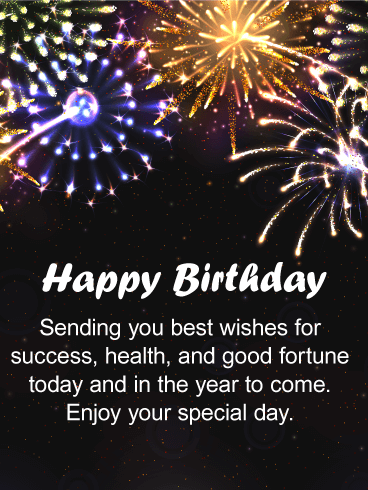 Make his birthday extra special and send this gorgeous birthday greeting card today. It is a rare and wonderful thing to know a man who speaks wisdom and offers kindness wherever he goes. This card honors that man. Modern, stylish, elegant. 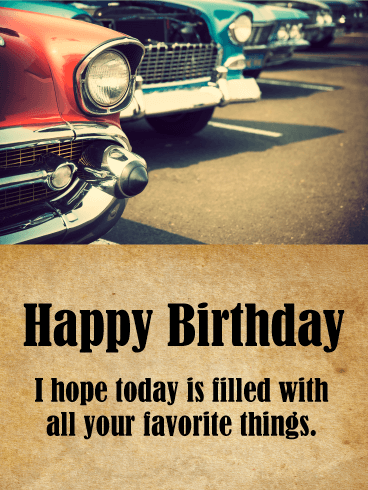 This birthday card for a great man is a sleek way to wish him a wonderful day. May his day be full of all his favorite things, and if nothing else, at least he knows you believe he's great and are thinking of him! 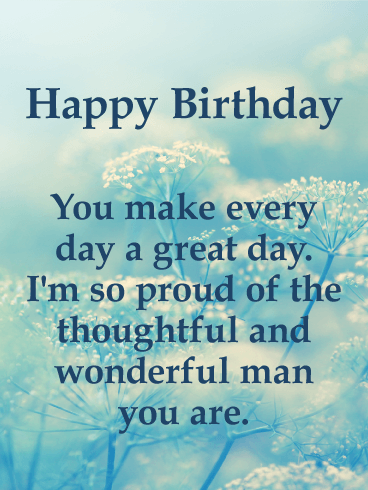 Take a moment and send a birthday greeting card to celebrate a special man in your life. Some men are one-of-a-kind and they're exactly what we need more of in the world! 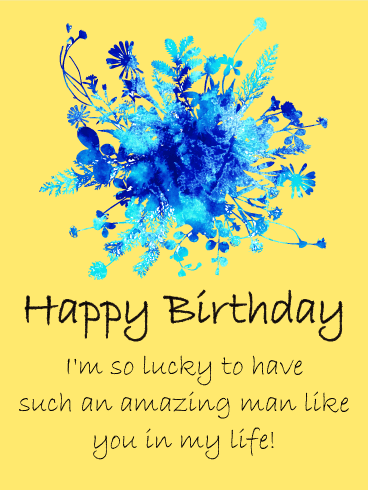 Let a terrific man know how much you value him and send him this stunning birthday greeting card. 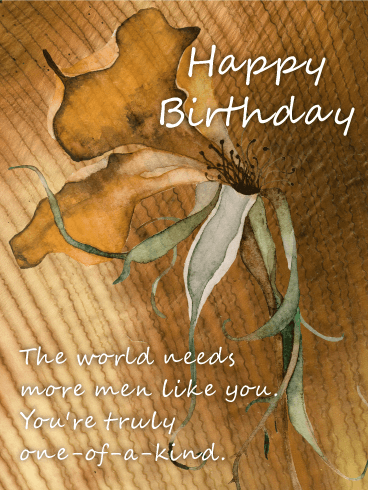 Men feel beauty deeply too, and this card reflects their unique talents and rare gifts. 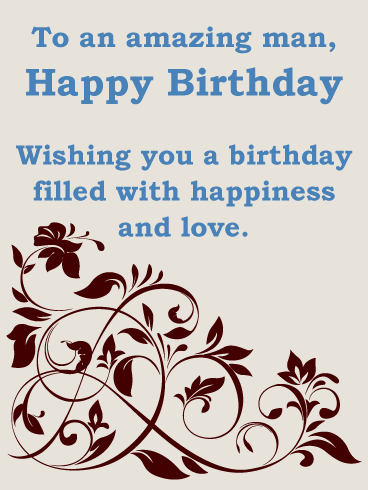 Send a beautiful birthday card to a wonderful man you know today, and help him celebrate his special day! 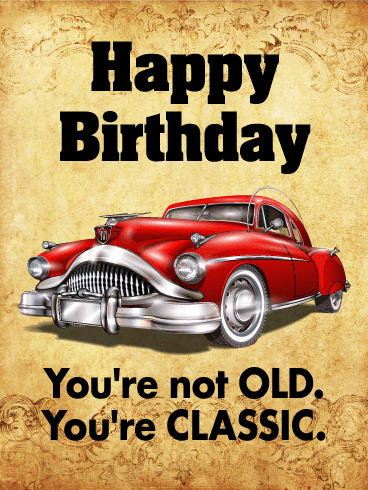 If you know someone who's celebrating a birthday and also happens to be a car fan or collector, this is the perfect birthday card for them! The antique cars in the background give this a rustic element, while the well wishes add for a sweet touch. This birthday card is one of a kind and sure to bring a smile to your loved one on their big day.